June 28–29, 2014: The day of my trip had finally arrived. I kissed Jen and Heidi goodbye and hopped on a train to Newark for my 10 p.m. flight. I was a little concerned that they had shut down the monorail service to the airport from the train station for repairs, but the temporary shuttle service they set up ran smoothly and I got to the airport in plenty of time. As I went through security, I was apparently in some sort of express lane because I didn’t have to take my shoes off or empty my pockets or anything. In fact, the TSA agent yelled at me when I started to do so. I reached my gate with a couple of hours to spare, so I passed the time in a Heineken lounge. The time flew by, and before I knew it, we were wheels up. I tried to sleep on the flight but I’ve never been very good at that; I think I managed a few winks here and there. I normally prefer an aisle seat when flying, but I found that an aisle seat makes it nearly impossible to sleep because you have people bumping into you all night as they walk up and down the aisle, so for this flight I chose a window seat. The downside was that I was sitting next to someone who refused to stand up when I needed to exit my seat, forcing me to climb over him and, at one point, causing me to spill water all over myself. Oh well, at least it dried by the time we landed. Upon exiting the tube station it was about a 10-minute walk to my apartment building. 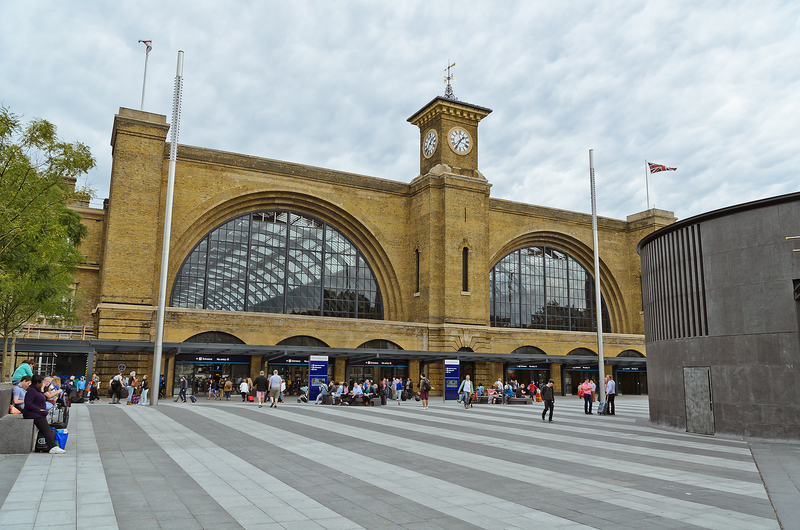 I arrived early and wouldn’t be able to check in for another couple of hours, so I left my luggage in the lobby and decided to take a walk to King’s Cross and St. Pancras train stations. With two hours to kill, it was a good opportunity to get the lay of the land and figure out where I would need to report for all of those 6 a.m. excursion departures on my schedule. The walk over was cold, windy, and rainy. The rain would be a recurring theme during my stay as England definitely lived up to its wet reputation, but the temperature thankfully warmed up for the rest of my London fortnight. 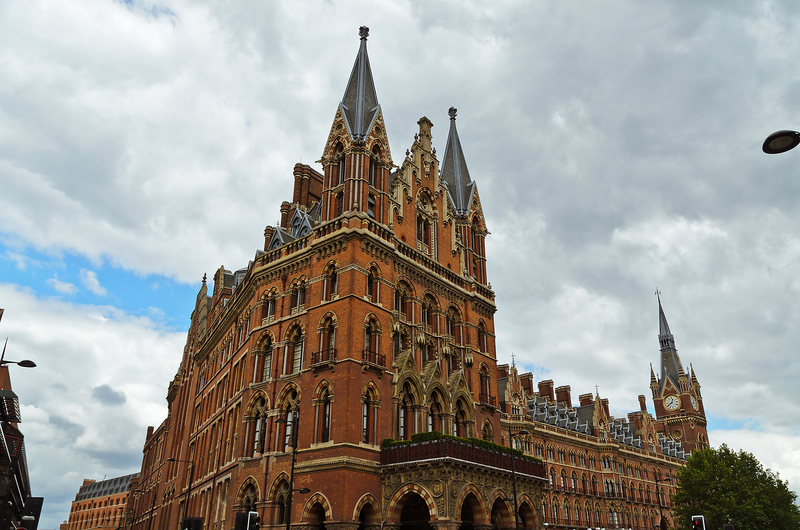 I first encountered St. Pancras; its facade dominates the area and can be seen from a good distance down the street. 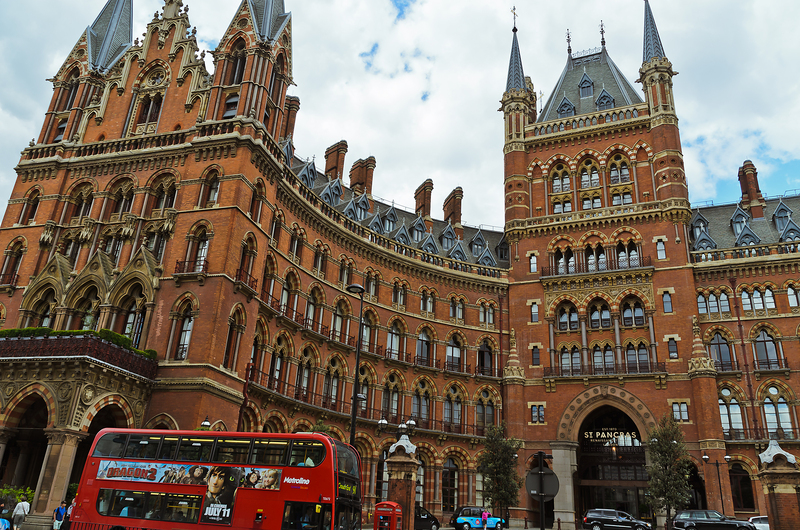 St. Pancras train station in all its Gothic glory. 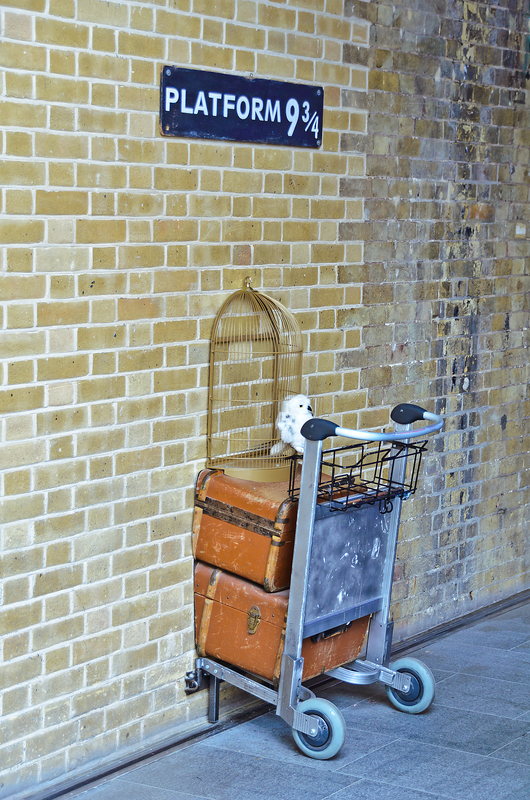 I couldn’t leave King’s Cross without seeking out Platform 9 3/4. It wasn’t very hard to find; I just had to look for the long line of people waiting to get their photos taken. By this point I was feeling pretty hungry; I hadn’t eaten since our little breakfast on the airplane. I didn’t want to eat a full meal—I figured I’d have dinner later—so I stopped at a food kiosk outside King’s Cross station, where I ordered some very tasty garlic fries (or chips, as they call them in England). That was all I had planned to order, but then I saw something I could not resist—a chocolate cronut. Although I live near New York, where cronuts were invented, I had never eaten one, so I wasn’t about to pass up the chance, and it looked delicious. This chocolate cronut did not disappoint. I then headed back to my apartment building to check in after first trying unsuccessfully to find a trash can anywhere near King’s Cross. I did see a person walking around picking up trash, which led me to wonder: Do they just drop their trash on the ground here? I decided to keep the trash with me and throw it out when I got back to my room. After checking in, one of the front desk attendants led me up three flights of stairs to my flat. I had requested a room on the top floor after reading some reviews of thin walls, hoping that it would be quieter without anyone being over top of me. As I dragged my heavy luggage up an increasingly narrow stairwell, I was beginning to regret that decision, knowing that I would have to make this climb for two weeks. But in the end I was glad I chose it because it felt very private and I never heard much noise up there. I unpacked a bit and then caught a short nap before my visit to The Shard since I had been awake for the better part of 24+ hours. I wound up skipping dinner, figuring that sleep was more important, but before long, it was time to catch the tube down to central London. I had an 8 p.m. reservation at The Shard, which is the final entry time of the day for the view from the top. 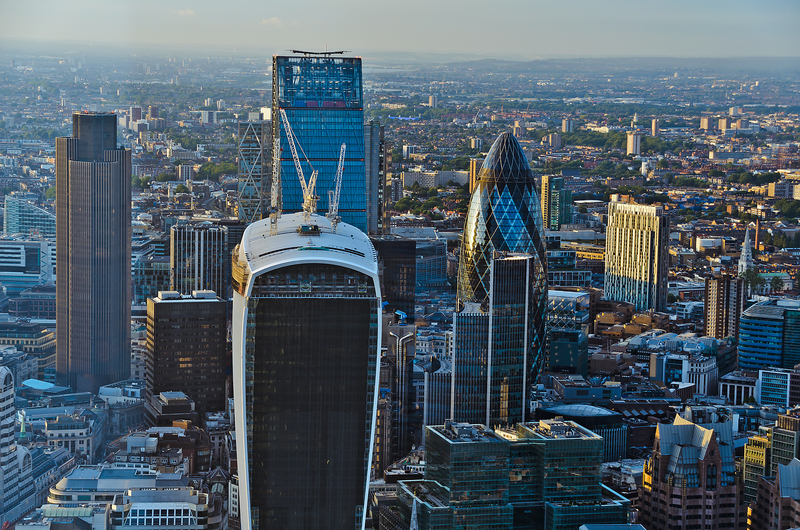 During the summer, that’s the best time to go because you can stay up there until after dark, which means you can enjoy a bird’s eye view of London both during the day and at night, with a beautiful sunset in between. I headed home a little after 10 p.m. and got back around 11, calling it an early night since I was basically running on fumes by this point. It was time to catch up on some of that sleep I’d lost on the flight over so I could wake up refreshed and ready to tackle the rest of London in the morning. That chocolate cronut looks delicious!!! Great pics!